We were all feeling a little Monday morning whingey in our usual catch up meeting today; traffic, kids, weather (sorry we don’t seem to have had the Indian summer that everyone else in the country is referring to). When the subject came round to where the team had eaten out over the weekend things really started to get heated as rather a large number of pet hates came out – some were more vociferous than others. Now we spend most of our time telling you what Design Restaurants Loves… so maybe its time to balance this out? So this happened to one of our team on a Spa day this weekend. Her party had decided to have lunch early at 12.15 due to an afternoon full of treatments. 3 of the 4 ordered the duck salad from an unextensive menu of just 6 dishes and were told there was only one portion of duck left! Now this is going to raise suspicions that the food is not being produced fresh… at a spa! Obviously if you turn up for a Sunday Roast at 3.40pm you have to expect that not all of the joints may still be on but not when you arrive early?! NO! NO! NO! Both our office veggies practically steamed from the ears when talking about the incredibly off-hand way vegetarians are sometimes dealt with – particularly in top-end restaurants. 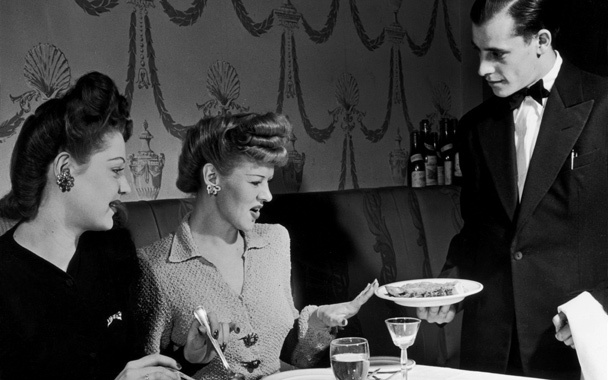 When eating out do you really want to have to create your own meal? Surely that is the chef’s job? Restaurants seem to think they are doing you a favor when they say they’ll cook anything you want… wrong! We’ve come to be inspired – not to do the work ourselves. Our vegetarian MD was also recently dining at a highly prestigious restaurant newly opened in town with a chef team over from Spain and when ordering the tasting menu was told there was not a veggie version but they would substitute dishes from the starters menu. The sting was she was charged the same price as the rest of the dining party (£120 per person) – even though she only got to try out starters which basically amounted to salad leaves and soup, while the rest of the party dined on Ox-Cheeks and Beef Blade. Not progressive. Again something that is often seen in restaurants ‘trying’ to appear top end – but this only works if the waiter is dedicatedly watching your table – which is also something none of us want! We all decided that we are grown up enough to pour our own wine out and would rather have that control than have to stress all the time that they notice you need topping up! And the worse is when you’ve only had what appears to be one glass and they tell you the bottle is empty – really??? This can make some of us really rather tetchy wanting evidence that it was drunk by me please – not something that would be an issue if the bottle was controlled by the diner. This was something we were ALL in agreement over and we’re sure there will be a backlash against this soon as it appears on many lists of this type. When going out for a nice meal after a hard week at work – no-one wants to have to play the ‘will we/won’t we get in’ game – OR heaven forfend QUEUE! Nope – here at DR no matter how great the restaurant believes itself to be we will all refuse to go if they won’t guarantee our booking. I mean if you out shopping on a Saturday with the kids then waiting in line at Waga’s is one thing. But not when we are dressed up and keen to start the evening. Restaurants need to have the courage of their convictions and trust their bookings will show up – they will if the dining is good enough. Now – we know they have their place, in fact Team DR very much enjoyed the Caprice pop-up at this summers Masterpiece Exhibition. Pop-ups of well known restaurants allow wider enjoyment of some fabulous food. We are also all about new design concepts which often pop-ups do extremely well. However here our positive vibe ends. There is a very fine line between budget and innovation and often this is where the pop-ups fall down. The residing factor all the best restaurants have in common is reputation. Pop-ups don’t need one however because they won’t be there next week! This means if it’s genuinely good you can’t go back, and if it’s rubbish you can’t complain. Waiters don’t have to be nice, or knowledgeable. And our final irritation is that these places think they can get away with whatever because suddenly pop-ups are fashionable. Not for long in our book. You know the type – the ones who actually ‘hunker down’ next to your table in that vaguely American way with no sign of a menu or order pad asking ‘How we’re all doing here today?’. Go. Away. If this is combined with a ‘have you been here before?’ our hackles really go up. Properly accomplished waiters have an inbuilt gauge to know just how familiar you want them to be – and this is NOT something they can work out in the first two minutes. Therefore, friendly and welcoming – BUT NOT PART OF OUR DINING PARTY! And please, please, please do not keep interrupting and asking every 3 minutes if ‘everything is ok’ when I clearly have a mouthful of food or are deep in conversation with my REAL dining companion. One of our team this Sunday at afternoon tea was asked FOUR times by THREE different waiters! Now if this isn’t bound to give you hiccups nothing is. We’ll tell YOU if we are not happy. We have come to eat, enjoy the company we are with and be waited on – not to become temporarily best-mates with our waiter. When you walk in and your heart sinks as you are shown to a table by the door and behind the already drunk party of 10, so you’ll need to shout to be heard and will be in a constant draft. Two of our team were enjoying a Saturday morning brunch at a popular local brasserie and their table by the door was held open by the waiter as he waited for the departing family of five to button up each of their children and load them into various car seats and pushchairs. Both of their Eggs Benedict ended up stone cold and they actually sent them back siting the waiter as the cause! If tables are by doors then consideration needs to taken by all members of staff to those people unlucky enough to be plonked their. Even worse is when you are shown to a crap table in the middle of the room even though several tables at the edge of the room (with the view) are available and when you query it being told they are already reserved…. and then during your meal of one and a half hours no-one comes in and sits there!!!! This can be truly exhausting for both customer and waiter. Tasting menu’s are the exception as these are designed for the staff to actually take you through it step by step. When it is on a bog standard Table D’Hote it is just plain annoying. Unless there is a clear indication of what the main ingredients of the dish are, the ‘jus’, ‘espuma’ and ‘ballotine’ don’t do anything to up sell the dishes and could just be an elaborate way of making a plain dish sound more accomplished. Having to continually call the waiter over to ask them what exactly the dish is can be off putting and even intimidating. Now – if they’ve squeezed you in as an early non-booking then that is fair enough – but not if you’ve actually booked your table in advance! When we go out to eat, unless you are moving on to the theatre or some such event in which case you would normally book an appropriate venue which has a fast turnaround anyway, the evening is one to be lingered over and you assume the table is yours for the rest of the night – right? Apparently not – our team have been told on several occasions that a 7pm table has been rebooked out at 9pm. Now we understand that people who linger all night long over a starter and a jug of tapwater must be the bane of restaurant owners lives – but the majority of us are just enjoying a well deserved night out and will probably order another bottle of wine if left alone. Now – tipping gets people into a right tizz. It is an ethical and moral minefield. How much is enough – 10% or 15%? Should you always? Or only when the service has been outstanding? Top of the list of our complaints on tipping however is when the service charge is discretionary but they add it to the bill ANYWAY! This means, if you have been unhappy with the meal you have to actively ask for it to be removed from the bill – or you need to work out what 12.5% less would be. Is it better for the actual bill to be settled and then for the customer to decide themselves how much to tip – or is it simply less complicated and less awkward all round to simply pay the service charge and try and remember NOT to round up the final amount? This one we couldn’t answer but it remains a top gripe – the stress at the end of lovely evening which often results in over-tipping simply to escape from the dilemma! Forgive us this whinge but thanks for listening and sure we’ll be back to our usual sunny selves tomorrow! Excellent goods from you, man. I’ve take into account your stuff prior to and you’re just extremely great.